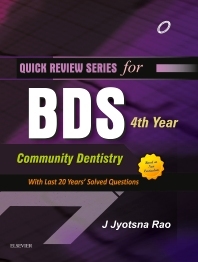 Quick Review Series (QRS) for BDS 4th Year: Community Dentistry is an extremely exam-oriented book. The book includes a collection of last 20 years' solved question papers of Prosthodontics from various universities like RGUHS, NTRUHS, MUHS, MGRUHS, etc. according to the new syllabus of BDS 4th year.